We believe that inclusion for people with disabilities in community life is so important. The Arc fosters social connections and relationships throughout the year through parties, gatherings, and other community events. Join us! THE MOST RECENT ANNUAL EVENT WAS HELD APRIL 6, 2019. It was a packed house and a wonderful night. The Annual Meeting for the Arc of New River Valley is a fun event featuring a dinner with live music and a fund raising event. The evening includes new Board member elections and the Renee Brown award. The event is an opportunity for members and friends to come together to show support for the Arc’s important work for people with disabilities and their families. It is also an evening of camaraderie, good food, and fellowship. Each December we put the Christmas Cookie Party on our calendar. The Arc of the New River Valley Board members, community members and friends get together to enjoy a tempting array of homemade cookies and other kinds of sweet treats as we sing along to holiday songs. 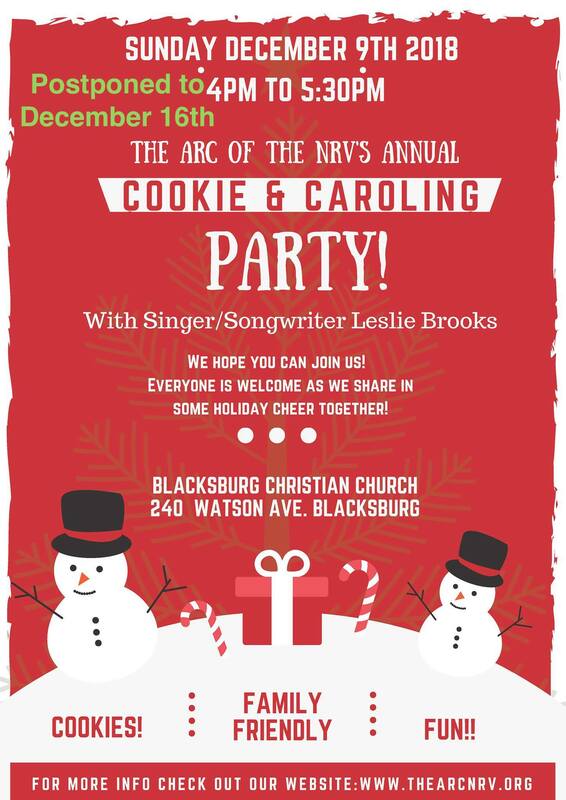 We gathered on December 16, 2018 for an evening of cookies, fun, and song with singer/songwriter Leslie Brooks. A great time was had by all. Awarded each spring at the Arc of NRV annual dinner, the Renee C. Brown award shines a light on remarkable individuals in our community who embody the Arc’s vision: People with disabilities leading full, rich lives as active contributing members of the communities.” The award is named for Renee Brown, a former Board member of the Arc of NRV, and beloved member of the Blacksburg community. Spring is the time we come together for the Annual Dinner and Dance. Fall is a time to celebrate with a pot luck and dancing. We always have our holiday Cookie Party after our December Board meeting. We hope you can join us for these and other events.